State agriculture officials and executives at a major poultry operation have announced thousands of chickens at three farms have been euthanized over the suspected presence of bird flu. The company, Aviagen, said it found the presence of virus antibodies in a flock, even though none of the chickens displayed symptoms of the disease. Officials were on high alert because the operation in Northern Alabama is just across the state line from a Tennessee farm where bird flu was detected last month. According to Reuters, the company euthanized the flock and destroyed the eggs that had been collected from the chickens. Reuters quotes Alabama State Veterinarian Tony Frazier as saying about 15,000 chickens, out of a flock of around 153,000, were killed. Alabama.com, a local news website, reports Frazier has issued a "stop movement" order for some poultry in the affected area. Officials so far believe the suspected outbreak is confined to a limited area. Preliminary test results have confirmed bird flu at three sites, but further testing by the U.S. Department of Agriculture (USDA) will determine the strain of flu and its severity. Last week the USDA completed testing on bird flu samples from Lincoln County, Tenn., confirming the strain as H7N9 HPAI. All eight gene segments of the virus show that the virus originated among North American wild birds. USDA took pains to point out the strain is different from the severe H7N9 virus that impacted poultry and caused illness among humans in Asia. "USDA continues to work with the Tennessee Department of Agriculture on the joint incident response," the agency said in a release. "Birds on the affected premises have been depopulated, and burial is in progress. An epidemiological investigation is underway to determine the source of the infection. Bird flu spreads quickly among animals but so far can only be transmitted to humans who come in contact with an infected bird. There have been no confirmed cases of human to human transmission of the virus. America's health concerns this fall are focused firmly on Ebola, a deadly virus that appears to kill half its victims. Though largely confined to West Africa, the death in Dallas of a recent visitor to that region – and the subsequent infection of two medical personnel who cared for him – has made Ebola dominate every news cycle, even when there is nothing new to report. Dr. Daniel Hussar, pharmacy professor at Philadelphia College of Pharmacy, thinks Americans should take a breath and stop worrying about Ebola. It's the flu we should be worrying about, he says. Ebola might kill, if it spreads in the U.S., which Hussar says is unlikely. But flu, he points out, does kill year in and year out. He says there were 131 flu-related deaths in Pennsylvania alone last flu season. Influenza remains a leading cause of death in the U.S, according to the Centers for Disease Control and Prevention (CDC). “While everyone should get a flu vaccine this season, it’s especially important for infants, children, pregnant women, and seniors because they are most vulnerable to developing serious complications – like pneumonia – if they catch the flu,” he said. According to its study of the 2012-2013 flu season, the CDC estimates that the flu vaccine prevented 79,000 hospitalizations and 6.6 million illnesses. Still, more than 381,000 Americans were hospitalized because of flu-related illness during that season. Dr. Charlene Chick, a family physician at the Rowan University School of Osteopathic Medicine, is also strongly urging consumers to get a flu vaccine. She points out that to avoid contact with the virus you would also have to avoid going out in public during flu season. You couldn't touch things like elevator buttons, door knobs, ATM keypads and stair railings where the flu can be left behind by someone who is infected. And that, in short, is what makes flu a bigger threat. Unlike Ebola, it can be transmitted through the air, from person to person. Germs left on objects can live for long periods of time, allowing them to infect multiple people. The Ebola virus is spread through contact with an infected person's bodily fluid. Scientists believe that until an infected person begins having symptoms they can't spread the virus. Ebola viruses left on an inanimate object die very quickly. In short, Ebola is harder to get than the flu. “Don't let the recent Ebola news headlines distract you from taking measures to protect yourself and your loved ones from the much greater risk of catching the flu,” Hussar said. Hussar says there is a lot of misinformation about flu vaccines out there. For example, he says the vaccine is perfectly safe for pregnant women. Also, it's never too late to get a flu shot. Even late in the season the vaccine can provide protection within two weeks of receiving it. Don't like shots? Hussar says you can still get vaccinated with the nasal spray option. This vaccine, is commonly known by its trade name, FluMist, and offers protection to healthy adults from 2 to 49 years old who are not pregnant. FluMist contains a live but weakened flu virus that cannot cause flu illness. In much of the Northern Hemisphere, this is prime time for colds, flu, and other respiratory illnesses. While contagious viruses are active year-round, fall and winter are when we're all most vulnerable to them. This is due in large part to people spending more time indoors with others when the weather gets cold. Most respiratory bugs come and go within a few days, with no lasting effects. However, some cause serious health problems. Although symptoms of colds and flu can be similar, the two are different. Colds are usually distinguished by a stuffy or runny nose and sneezing. Other symptoms include coughing, a scratchy throat, and watery eyes. No vaccine against colds exists because they can be caused by many types of viruses. Often spread through contact with mucus, colds come on gradually. Flu comes on suddenly, is more serious, and lasts longer than colds. The good news is that yearly vaccination can help protect you from getting the flu. Flu season in the United States generally runs from November to April. Flu symptoms include fever, headache, chills, dry cough, body aches, fatigue, and general misery. Like colds, flu can cause a stuffy or runny nose, sneezing, and watery eyes. Young children may also experience nausea and vomiting with flu. More than 200,000 people in the United States are hospitalized from flu-related complications each year, including 20,000 children younger than age five. Flu-associated deaths number in the thousands each year. Between 1976 and 2006, the estimated number of flu-related deaths every year ranged from about 3,000 to about 49,000. 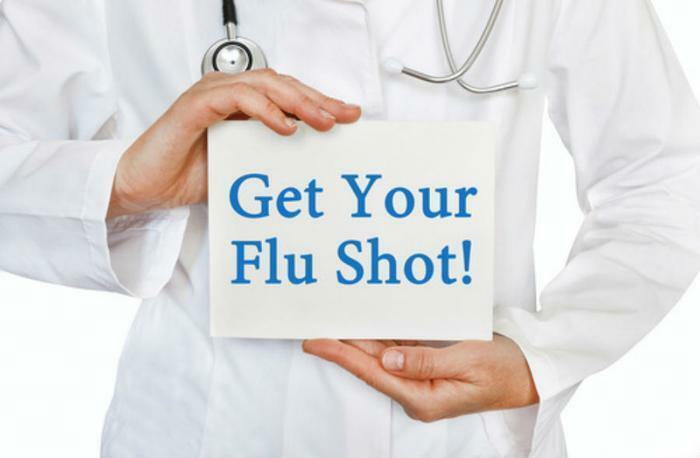 Flu vaccine, available as a shot or a nasal spray, remains the best way to prevent and control influenza. The best time to get a flu vaccination is from October through November, although getting it in December and January is not too late. 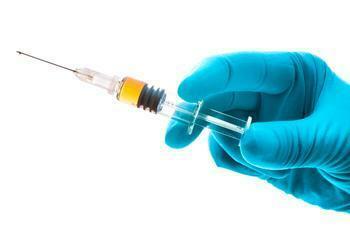 A new flu shot is needed every year because the predominant flu viruses may change every year. Flu vaccination for health care workers is urged because unvaccinated workers can be a primary cause of outbreaks in health care settings. Note that only one vaccine is needed for the 2010-2011 influenza season. During last flu season, two different vaccines were needed; one to prevent seasonal influenza and another to protect against the 2009 H1N1 flu virus. This year's seasonal flu vaccine protects against three strains of influenza, including the 2009 H1N1 flu virus. Also, a vaccine specifically for people 65 years and older is available this year. Called Fluzone High-Dose, this vaccine induces a stronger immune response and is intended to better protect the elderly against seasonal influenza. This vaccine -- which was approved by FDA in 2009 -- was developed because the immune system typically becomes weaker with age, leaving people at increased risk of seasonal flu-related complications that may lead to hospitalization and death. Wash your hands often. Teach children to do the same. Both colds and flu can be passed through coughing, sneezing, and contaminated surfaces, including the hands. CDC recommends regular washing of your hands with warm, soapy water for about 15 seconds. FDA says that while soap and water are undoubtedly the first choice for hand hygiene, alcohol-based hand rubs may be used if soap and water are not available. However, the agency cautions against using the alcohol-based rubs when hands are visibly dirty. This is because organic material such as dirt or blood can inactivate the alcohol, rendering it unable to kill bacteria. Try to limit exposure to infected people. Keep infants away from crowds for the first few months of life. This is especially important for premature babies who may have underlying abnormalities such as lung or heart disease. Exercise. It can help the immune system better fight off the germs that cause illness. Do your best to keep stress in check. Also, people who use tobacco or who are exposed to secondhand smoke are more prone to respiratory illnesses and more severe complications than nonsmokers. Usually, colds and flu simply have to be allowed to run their course. You can try to relieve symptoms without taking medicine. Gargling with salt water may relieve a sore throat. And a cool-mist humidifier may help relieve stuffy noses. First, call your doctor. This will ensure that the best course of treatment can be started early. If you are sick, try not to make others sick too. Limit your exposure to other people. Also, cover your mouth with a tissue when you cough or sneeze, and throw used tissues into the trash immediately. Stay hydrated and rested. Fluids can help loosen mucus and make you feel better, especially if you have a fever. Avoid alcohol and caffeinated products. These may dehydrate you. Know your medicine options. If you choose to use medicine, there are over-the-counter (OTC) options that can help relieve the symptoms of colds and flu. If you want to unclog a stuffy nose, then nasal decongestants may help. Cough suppressants quiet coughs; expectorants loosen mucus so you can cough it up; antihistamines help stop a runny nose and sneezing; and pain relievers can ease fever, headaches, and minor aches. In addition, there are prescription antiviral medications approved by FDA that are indicated for treating the flu. Talk to your health care professional to find out what will work best for you. Be wary of unproven treatments. It's best to use treatments that have been approved by FDA. Many people believe that products with certain ingredients -- vitamin C or Echinacea, for example -- can treat winter illnesses. Unless FDA has approved a product for treatment of specific symptoms, you cannot assume the product will treat those symptoms. Tell your health care professionals about any supplements or herbal remedies you use. Read medicine labels carefully and follow directions. People with certain health conditions, such as high blood pressure, should check with a health care professional or pharmacist before taking a new cough and cold medicine. Some medicines can worsen underlying health problems. Choose appropriate OTC medicines. Choose OTC medicines specifically for your symptoms. If all you have is a runny nose, use only a medicine that treats a runny nose. This can keep you from unnecessarily doubling up on ingredients, a practice that can prove harmful. Check the medicine's side effects. Certain medications such as antihistamines can cause drowsiness. Medications can interact with food, alcohol, dietary supplements, and each other. The safest strategy is to make sure your health care professional and pharmacist know about every product you are taking, including nonprescription drugs and any dietary supplements such as vitamins, minerals, and herbals. Check with a doctor before giving medicine to children. Get medical advice before treating children suffering from cold and flu symptoms. Do not give children medication that is labeled only for adults. Don't give aspirin or aspirin-containing medicines to children and teenagers. Children and teenagers suffering from flu-like symptoms, chickenpox, and other viral illnesses shouldn't take aspirin. Reye's syndrome, a rare and potentially fatal disease found mainly in children, has been associated with using aspirin to treat flu or chickenpox in kids. Reye's syndrome can affect the blood, liver, and brain. Some medicine labels may refer to aspirin as salicylate or salicylic acid. Be sure to educate teenagers, who may take OTC medicines without their parents' knowledge. See a health care professional if you aren't getting any better or if your symptoms worsen. Mucus buildup from a viral infection can lead to a bacterial infection. With children, be alert for high fevers and for abnormal behavior such as unusual drowsiness, refusal to eat, crying a lot, holding the ears or stomach, and wheezing. Cold and flu complications may include bacterial infections (e.g., bronchitis, sinusitis, ear infections, and pneumonia) that could require antibiotics. Remember: While antibiotics are effective against bacterial infections, they don't help against viral infections such as the cold or flu. Gas may be cheaper this summer but that's not the case for another staple of daily life -- the lowly egg. 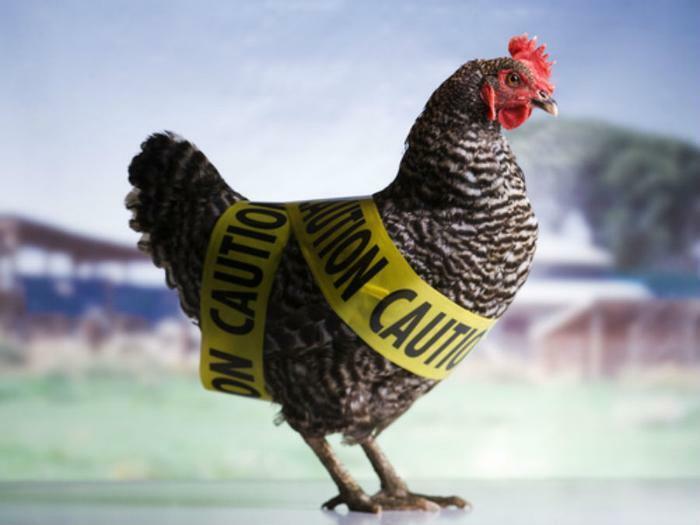 Thanks to a massive outbreak of bird flu in the Midwest, there just aren't enough healthy chickens reporting for work each day to keep up with the demand. Nearly 40 million chickens have died or been exterminated as poultry producers try to stop the spread of the disease, more than double the number lost in the last outbreak back in the 1980's. Wholesale prices for the eggs sold at supermarkets are up about 85% at $2.20 a dozen in parts of the country, according to the Wall Street Journal. Similar increases are hitting industrial users like McDonald's, which could affect the price you pay at the drive-through window depending on how long it takes the nation's poultry flock to recover. There's no apparent risk, other than menu disruption, to humans from the H5N2 strain of avian influenza but it is hitting the bird population very hard. Scientists say the strain is a combination of a virus that originated in Asia and later combined with North American versions. It's apparently being spread through the droppings of wild ducks and geese. The disease is centered in the Midwest, leading Iowa state officials to announce a ban on live-bird shows for the rest of the year. Minnesota has done the same. "We are asking producers and bird owners to increase their biosecurity measures and we feel this is a needed step to further minimize the risk of spreading the virus," Iowa Secretary of Agriculture Bill Northey said. "The scale of this outbreak has been unprecedented, so we think it is important we take every possible step to limit the chance that this disease will spread any further." 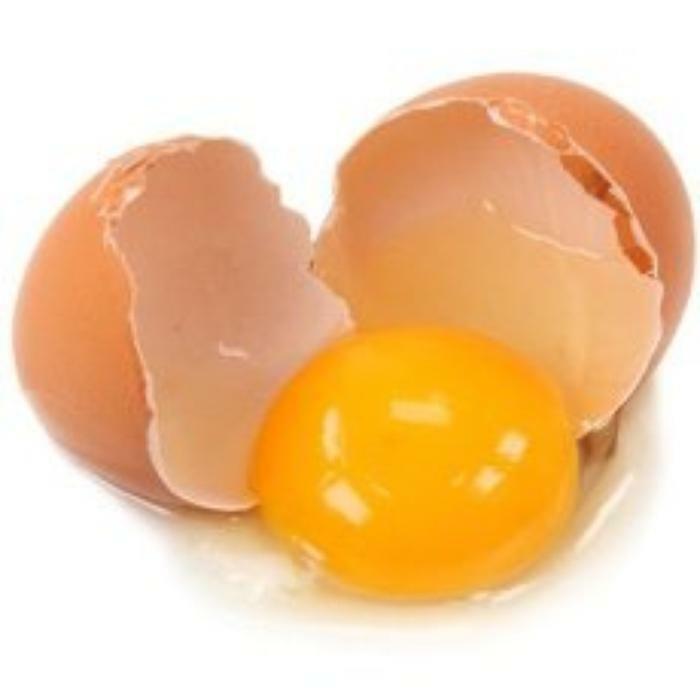 Iowa, the nation's top egg producer, has had 63 avian flu outbreaks affecting more than 25 million birds. Every year health officials roll the dice when they assemble the annual flu vaccine. The vaccine is engineered to protect against the strains of flu most likely to hit the U.S. If they guess wrong, the flu vaccine ends up being much less effective. Wouldn't it be better if there could be some sort of all-purpose, universal flu vaccine? Scientists at Rockefeller University thought so, and went about trying to harness a previously unknown mechanism within the immune system to create vaccines that would protect against this constantly-mutating virus. The Centers for Disease Control and Prevention (CDC) studies the effectiveness of each year's vaccine to guard against the flu. Overall estimates for each season range from a low of 10% to a high of 60%. Last year's effectiveness was closer to the bottom – 23%. The Rockefeller University researchers' work revolved around chemical modifications to antibodies to make them more potent against the flu virus. A successful vaccine that proves effective against more strains of the flu would not only result in fewer illnesses, but fewer deaths too. The flu kills thousands of people in the U.S. every year. These victims, usually elderly, may have been vaccinated, but the predominant strain that infected them happened to be one not covered in the vaccine. Vaccine makers' task is more difficult because flu strains can be so diverse and new ones are constantly emerging. Types A and B cause seasonal flu epidemics. Influenza A viruses are further broken down into subtypes based in part on their surface proteins, which include hemagglutinin, the “H” in H1N1, for example. The subtypes are further divided into strains. Today, when vaccine makers assemble a flu vaccine, they create a formula that targets 3 or 4 viral strains, along with a few influenza B strains. They base their selections on public health experts’ predictions for the coming flu season. When they're wrong, millions of people who get the shots may also get the flu. Because of that, researchers everywhere have sought a universal flu vaccine. Have the Rockefeller University researchers found it? They say the early results are encouraging. Avian, or bird, flu, has devastated commercial chicken and turkey operations in the Midwest, resulting in the culling of millions of birds. But beyond its economic impact there are serious health concerns. In Asia strains of the avian flu have passed from bird to humans, with health officials estimating 1 in 3 humans who contract the illness die. Now, researchers in the U.S. have developed a vaccine for two new strains of bird flu. While providing some protection it is also expected to help researchers make additional vaccines for new strains of avian influenza more quickly. As a result, the number and intensity of large-scale outbreaks at poultry farms could diminish and transmission to humans become less of a threat. Jürgen Richt, Regents director of the U.S. Department of Homeland Security's Center of Excellence for Emerging and Zoonotic Animal Diseases says it could also lead to flu vaccines for pigs and other livestock. 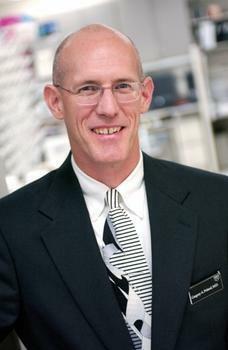 Richt and his colleagues at Kansas State Univesity focused on H5N1, a new strain seen mostly in Indonesia, Egypt and other Southeast Asian and North African countries. H5N1 also has been found in wild birds in the U.S. but is not believed to be widespread. "H5N1 is a zoonotic pathogen, which means that it is transmitted from chickens to humans," Richt said. "So far it has infected more than 700 people worldwide and has killed about 60% of them. Unfortunately, it has a pretty high mortality rate." The new vaccine for H5N1 came about when scientists put 2 viruses together. Tests show that the combined virus was an effective vaccine for chickens against both Newcastle disease virus and H5N1. Next the scientists focused their efforts on the bird flu subtype H7N9, which has been infecting birds in China since at least 2013. Since then there have been about 650 cases of H7N9 in humans and some 230 people have died. There are aspects of the new virus that make it more dangerous than previous strains. Again, tests showed that chickens vaccinated with the new Newcastle virus-based vaccine were protected against H7N9. A vaccine that could stop bird flu from spreading would be welcome news to the poultry and egg industries. Nearly 40 million U.S. chickens have died or been exterminated as poultry producers try to stop the spread of the disease. That’s more than double the number lost in the last outbreak back in the 1980's. All of this is having an impact at the supermarket. Some turkey producers have warned of possible shortages of the Thanksgiving Day staple and egg prices are skyrocketing. The Wall Street Journal has reported wholesale prices for the eggs sold at supermarkets are up about 85% at $2.20 a dozen in parts of the country. Restaurants specializing in breakfast are also feeling the pinch and will likely pass along the higher costs to consumers. A vaccine that could limit the carnage would likely alleviate much of this economic fallout, though it isn’t known how quickly that could happen. A ferocious virus is storming through North America, felling U.S. citizens at a rate higher than ever measure by the Gallup research organization. Ebola? No, flu. Americans nearly came unhinged when a handful of Ebola victims showed up for treatment last year but that was a mere drop in the ocean compared to the flu. 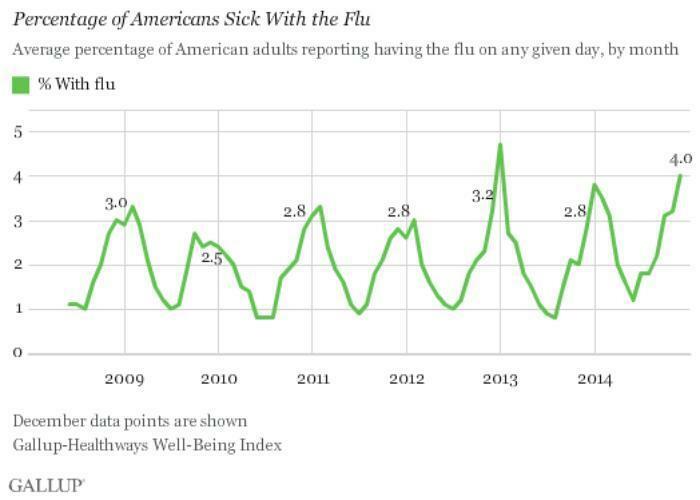 Gallup reports that an average 4.0% of Americans reported being sick with flu on any given day in December -- more than all previous Decembers since Gallup began tracking the flu daily in 2008, and one of the highest rates for any month over the past 7 years. The all-time high is 4.7%, measured in January 2013. Given that reports of having the flu are typically highest in January or February, the 2013-2014 flu season could end up being the worst flu season in Gallup's records. However, it may also be that the flu is peaking early this season, as happened in 2009-2010, when the flu peaked in October amid the outbreak of the H1N1 flu virus. As we reported earlier this week, the flu is already being blamed for the deaths of 15 children and the Centers for Disease Control and Prevention has found the flu "widespread" in 43 states. Nationwide, the CDC reports that 5.9% of doctor visits involved flu-like symptoms in the last week of December, up from 4.3% in the same week in 2013. At the CDC, director Dr. Tom Frieden says that however severe the season turns out to be, Americans need to be prepared. “We can save lives with a three-pronged effort to fight the flu: vaccination, prompt treatment for people at high risk of complications, and preventive health measures, such as staying home when you’re sick, to reduce flu spread,” Frieden said. This year's vaccine is not as effective as in some previous years because the flu virus continued evolving after the vaccine was formulated, so some strains don't respond to the vaccine. But that's no reason to skip getting a flu shot, CDC officials caution. The Gallup-Healthways Well-Being Index asks Americans each day whether they were sick with the flu "yesterday." This differs from the U.S. Centers for Disease Control and Prevention's measure, which tracks influenza infections reported from doctors and hospitals. However, Gallup's data closely conform with CDC data for December. In December, an average 11.6% of Americans reported they "were sick with a cold yesterday," the highest percentage Gallup has found for any month since 2008. Prior to December 2014, the highest rate was 10.8% in January 2013. The highest December reading before this year was in 2008, when an average 10.3% of Americans reported being sick with a cold. Generally, about three times as many Americans report having a cold as report having the flu. 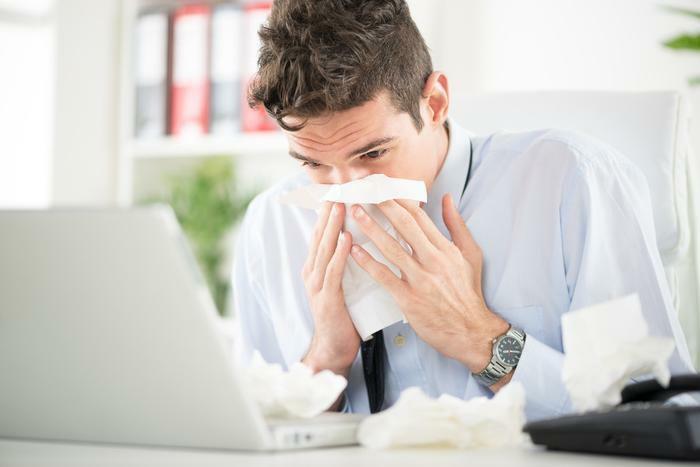 It is possible that Gallup's measures of daily cold and flu underestimate the true infection rate, because those who were sick the day before may be less likely to respond to a phone survey than those who were not sick. Additionally, it may be difficult for people to accurately self-diagnose the medical distinction between the flu and a cold, given the similarity in the symptoms of both conditions. Still, year-over-year comparisons provide useful information about the relative prevalence of flu and colds in the U.S. population. Are Flu Vaccines Really All That Effective? A new study conducted by the University of Minnesota questions the flu shot's true effectiveness. Personally, I’ve never gotten a flu shot and never gotten the flu, but it’s easy to see why so many people get them, since there has been a lot of documentation about their effectiveness. According to the Centers for Disease Control and Prevention (CDC), people over six months of age should receive their flu vaccinations each year, and annually the government health agency as well as other entities put out strong publicity campaigns that encourage people to get their shots. But not everyone believes the flu shot is the all-protecting serum that it’s advertised as, and although many health experts agree that getting a flu shot is better than not getting one, a lot of experts say people may be putting too much faith in a vaccine that might not be all that preventive. Researchers at the University of Minnesota recently said although the flu shot is helpful, there are many improvements the vaccine needs to undergo in order to match its public perception of being completely protective against the flu. “The current influenza vaccine protection is substantially lower than for most routine recommend vaccines and is sub-optimal,” said Michael Osterholm, the Director of the Center for Infectious Disease Research and Policy (CIDRAP), a research center that’s within the University of Minnesota. The researchers took this particular stance after examining 12,000 pieces of documentation stemming all the way back from 1936. They also interviewed almost 100 experts on the flu vaccine. Others who weren’t part of the University of Minnesota study said these new findings shouldn’t discourage people from getting flu shots; rather they should put pressure on government entities to improve the vaccine and better communicate the flu shots' true level of usefulness. Other health experts have also been critical of the way the flu shot has been advertised to the public as a completely preventive vaccine. Tom Jefferson, who is an epidemiologist with Cochrane Collaboration, a non-profit organization that’s involved in medical research, says that after reviewing a number of studies on the flu shot, many of the findings incorrectly indicate that the vaccine protects people from the flu more than it really does, specifically among the elderly. “We looked at studies on vaccines in the elderly and in health care workers who work with the elderly, and we found an implausible sequence of results,” said Jefferson in a published interview. “We have studies that claim up to 90 percent effectiveness against death from all causes. If you were to believe that evidence, you would believe that flu vaccine is effective against death not only from influenza, but also from heart attack, stroke, hypothermia, accidents and all other common causes of death among the elderly. That is quite clearly nonsense,” he said. Jefferson also says more studies are needed to prove the effects of the flu vaccine and says it’s time for government officials to largely increase their efforts to provide new and updated research about the effectiveness of the flu shot -- because until then, the general public will never be properly informed about how truly preventive flu vaccines are. Although researchers at the University of Minnesota would most likely agree with Jefferson’s opinion about the government’s need to provide better transparency about flu vaccines, Osterholm says people should still get the shot since it’s still the best preventive measure we know today. “It’s clear that influenza vaccination offers substantially more protection for the population then being unvaccinated, that’s why I’ve got my flu shot this year,” he said. Dr. Poland of the Mayo Clinic says that improvements on vaccines and all medicines is an ongoing effort, and bettering the public’s chance to avoid and beat certain illnesses will never be complete. “Urging them [government officials] to do what all of us already feel and many of them, myself included have published, and that’s we need better vaccines, he said. The Food and Drug Administration has issued warning letters to nine companies marketing bogus flu products behind claims that their products could be effective against preventing the avian flu or other forms of influenza. FDA said it is not aware of any scientific evidence that demonstrates the safety or effectiveness of these products for treating or preventing avian flu and the agency is concerned that the use of these products could harm consumers or interfere with conventional treatments. "There are initiatives in place to deter counterfeiters and those who sell fraudulent or phony products to prevent or treat avian flu," said Andrew von Eschenbach, MD, Acting FDA Commissioner. "The use of unproven flu cures and treatments increases the risk of catching and spreading the flu rather than lessening it because people assume they are protected and safe and they aren't. I consider it a public health hazard when people are lured into using bogus treatments based on deceptive or fraudulent medical claims." FDA issued warning letters to nine firms marketing products making unproven claims that they treat or prevent avian flu or other forms of influenza. Eight of the products purported to be dietary supplements. Examples of the unproven claims cited in the warning letters include: "prevents avian flu," "a natural virus shield," "kills the virus," and "treats the avian flu." These alternative therapies are promoted as "natural" or "safer" treatments that can be used in place of an approved treatment or preventative medical product. In the warning letters, the FDA advises the firms that it considers their products to be drugs because they claim to treat or prevent disease. The warning letters further state that FDA considers these products to be "new drugs" that require FDA approval before marketing. The letters also note that the claims regarding avian flu are false and misleading because there is no scientific basis for concluding that the products are effective to treat or prevent avian flu. The companies have 15 days to respond to FDA. 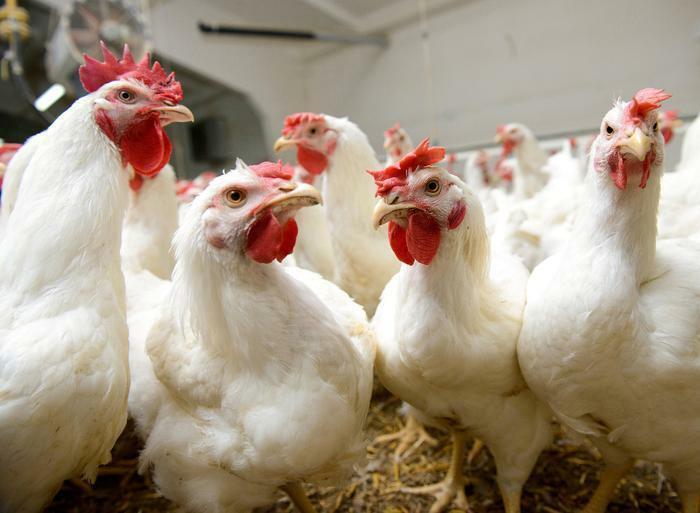 State health officials in Tennessee have confirmed the presence of a strain of highly pathogenic avian influenza (HPAI), or bird flu, has struck a poultry farm in Lincoln County, in the south central portion of the state. HPAI is contagious and deadly for chickens and turkeys. Humans can contract the virus from contact with an infected animal but, to date, there has been no human to human spread of the illness. October is finally here, but along with fall foliage and the annual seasonal holidays, consumers also have to prepare for the start of flu season. Getting a flu shot can provide some protection against the influenza virus, but the vaccine is not a guarantee of good health. According to the Centers for Disease Control and Prevention, influenza-like-illness is below baseline for the first time since early December. Other indicators are declining as well, signaling that the flu season is drawing to a close. The 2012-2013 flu season kicked off about 4 weeks early, with flu-like illnesses elevated for 15 consecutive weeks, making for a longer-than-average season. For the past 10 seasons, the flu has remained above baseline an average of 12 consecutive weeks with a range of one week to 16 weeks. More information about the recent flu season -- and influenza in general -- is available at Flu.gov. While previous outbreaks of bird flu haven't lived up to some fears about it, this latest strain of the virus that has shown up in China is causing growing concern. The virus, known as H7N9, has infected 108 people and killed 22 in China since early March, when it was first reported. The World Health Organization (WHO) says the virus normally circulates among birds. It's only been recently that it has shown up in people. “As yet, there is limited information about the scope of the disease the virus causes and about the source of exposure,” the WHO said in a statement. “The disease is of concern because most patients have been severely ill. There is no indication thus far that it can be transmitted between people, but both animal-to-human and human-to-human routes of transmission are being actively investigated. A human-to-human transmission would be a worst-case scenario. As long as the spread is limited to bird-to-human, a person would have to come in contact with a diseased bird in order to come down with the virus. However, if it is found that a person can catch the virus from a bird and then spread it to another human, health officials fear that would lead to a pandemic. Seasonal flu germs are easily spread among humans and the H7N9 is a particularly nasty virus for people. The good news, so far, is that health officials do not believe any of the human cases so far have been transmitted from another human. The bad news is that when humans do come down with the disease, it can be life-threatening. "This is definitely one of the most lethal influenza viruses that we've seen so far," said the WHO's Keiji Fukuda. From the animal side, WHO said only a handful of the tens of thousands of chicken and birds tested have been positive for H7N9. There have been no positive results in pigs and virtually none of those animals were sick, in contrast to H5N1, which is the bird flu that emerged 15 years ago. “With this different situation in animals, the presumed source of infection, we are still uncertain about the source of illness in people,” said Dr. Michael O'Leary, a WHO representative in China. 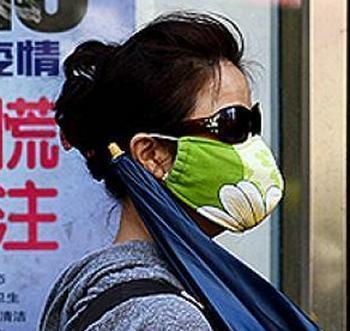 Until this week the outbreak had been confined to the Chinese mainland. This week there was a case of H7N9 reported in Taiwan. According to news reports a 53-year old man was stricken days after returning to Taiwan from Shanghai. He is reported hospitalized and in critical condition. China is especially vulnerable to bird flu because birds play a prominent role as a source of food and livelihoods. WHO said it and its health sector partners are working at the level where humans and animal come in contact to identify and reduce animal health and public health risks within China and other countries where poultry is a major industry. In the U.S. the Centers for Disease Control and Prevention (CDC) is monitoring H7N9 in China. The agency notes that not all the people infected had documented contact with poultry. The agency also reports that some limited person-to-person spread of a milder strain of bird flu may have occurred in the past. It says some limited human-to-human spread of this more “lethal” strain wouldn't be surprising. Last week's grilling of federal health officials at the hands of Congress may say a lot about rising public concern and frustration over the arrival of the deadly Ebola virus on American shores. While Republican lawmakers might be expected to take political shots at the Obama Administration over its handling of the Ebola outbreak, it's worth noting two prominent Democrats on the ballot next month – Wendy Davis of Texas and Kay Hagan of North Carolina – have broken with the White House and called for a temporary ban on flights from the 3 affected West African countries. Is the growing fear that Ebola could become a deadly epidemic in the U.S. justified? The medical community, for the most part, continues to insist it is not. Before the first case turned up in Dallas Ira Longini, professor of biostatistics at the University of Florida, released a study predicting a 20% chance of “isolated cases” of Ebola showing up in the U.S.
Now that the first cases have appeared, Longini is sticking to his prediction that there will be a very limited outbreak in the U.S. He also is not in favor of restricting travel. So far, Longini is one of the few experts willing to put a number on Americans eventually stricken with the disease. Based on containment methods available in the U.S., he said he believes the U.S. will see fewer than 100 cases of Ebola. The number of U.S. cases, he says, depends largely on the number of African cases. “Unless the epidemic continues to be completely out of control and more countries are affected and it gets much larger, I wouldn't expect to see more than a handful of cases in the U.S,” he said. Howard Markel, a doctor and medical historian at the University of Michigan, says there have been epidemics throughout history and most have been accompanied by fear. He cautions Americans against over-reacting. The reality, he says, is that Ebola is hard to catch and easy to kill. It's also a reality, he says, that most of the cases to date have been in people who live or worked in West Africa. “While there may continue to be transmissions to health care workers here in this country, the risk to most of us is quite small,” he said. In fact, the two Americans who contracted Ebola without visiting Africa are nurses who were part of the Dallas team that treated Thomas Eric Duncan, who died of Ebola after visiting West Africa. David Weber, professor of medicine, pediatrics, and epidemiology at the University of North Carolina Schools of Medicine and Public Health, warns that health care workers are particularly vulnerable, despite the strictest precautions. "In Africa, more than 300 healthcare workers have acquired Ebola,” he said. “More than 200 of those have died." Weber says the emphasis now should be on training health care workers to deal with Ebola, so that more are not infected while treating patients. The training needs to be completed now, he says, before there are patients. Getting a flu shot is your best chance of avoiding the flu, according to the Mayo Clinic. Each year the vaccine is engineered to counter the expected strains of the flu virus, so getting a shot doesn't make you bullet-proof. In past years unexpected strains have cropped up and people that got the shot got sick. However, these tend to be the exception, not the rule. Getting the vaccine simply improves your odds. If you choose not to get a flu shot, your other option is to constantly wash your hands and avoid public places where you might pick up the germ from an infected person. The flu can kill. It's a serious illness – more so for some people – the very old and very young – than others. The Centers for Disease Control and Prevention (CDC) estimates that over 31 flu seasons between 1976 and 2007, as many as 49,000 people in the U.S. died of flu-related complications. According to the CDC, about 90% of flu deaths during a regular flu season occur in people 65 years old and older. Getting a flu shot can also make flu season less dangerous for others. People get the flu, after all, from other people. If more people get flu shots and fewer of them get the flu, there are fewer flu germs in circulation. A final reason for getting a flu shot has nothing to do with the flu. Previous research has suggested that flu vaccines have proved effective against heart disease – even reducing the risk of a heart attack. A new study this month reveals why. The scientists who conducted it say the information could be used to prevent heart disease directly. Heart disease is known to be the leading cause of death worldwide. The risk can be reduced by eating healthily, exercising and stopping smoking. However, right now there is no vaccine against heart disease. Over the years clinical studies have shown that people who receive the seasonal flu vaccine get the added benefit of its protective effect against heart disease. The risk of heart attack in the year following vaccination is 50% lower than people who did not receive the vaccination. Until now, scientists haven't understood why. The latest study shows that the flu vaccine stimulates the immune system to produce antibodies that activate important processes in cells. These processes, in turn, lead to the production of molecules that protect the heart. Because of this discovery, the researchers say it may be possible to develop a new vaccine against heart disease. "Even though the protective effect of the flu vaccine against heart disease has been known for some time, there is very little research out there looking at what causes it,” said Dr. Veljko Veljkovic, Institute Vinca, Belgrade, the lead author of the study. Veljkovic and his colleagues propose more research, including ways the components of the flu vaccine might be used to create a vaccine against heart disease. No one likes getting sick, but it seems that many Americans are loathe to go out and get a vaccination when flu season comes around. Unfortunately, it might not just be hurting their health, though. A new collaborative report shows that U.S. consumers spent $5.8 billion on medical costs related to the influenza virus. But monetary problems don’t stop there. 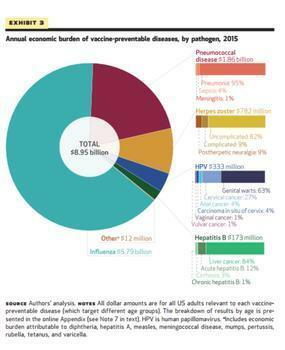 In all, Americans spent roughly $9 billion in 2015 on treating diseases that can be avoided by vaccination. All of this begs the question, what do consumers have against vaccines? 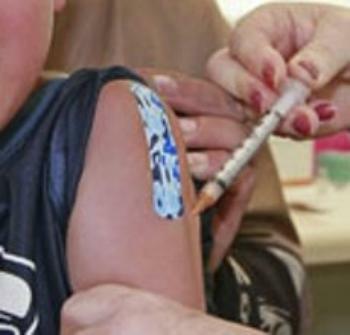 The debate over vaccinations became very polarizing and high-profile in recent years after a scientific study stated that they may be linked to autism. The study was later debunked and the findings were retracted, but the notion has stuck with consumers ever since. While the debate over whether or not a parent should vaccinate their child continues to rage, many adults have stopped getting vaccinations as well. Reports from the Centers for Disease Control and Prevention (CDC) shows that the majority of U.S. adults avoided getting their flu shot last year, and the study’s authors believe that this hesitance could have major economic repercussions. “Vaccines save thousands of lives in the United States every year, but many adults remain unvaccinated. Low rates of vaccine uptake lead to costs to individuals and society in terms of death and disabilities, which are avoidable, and they create economic losses from doctor visits, hospitalizations, and lost income,” they said. The researchers admit that increasing the rate of vaccination won’t entirely erase the amount of money lost by consumers. In fact, they even go far as to say that vaccines are not always a 100% guarantee of good health. However, they say that opening the public’s eyes to this growing problem should encourage consumers and lawmakers to look at the problem critically so that it can be addressed. “By highlighting the tremendous financial burden that unvaccinated individuals place on the economy and the health system, we hope that our estimate will spur creative policy solutions,” they said. The full study has been published in Health Affairs.